· We greet you at either the Buon Ma Thuot airport or bus station to your hotel. Pick you up at your hotel after breakfast at 8 am, and go to visit Akothon (Ako Dhong) village (the village of Ede minority people), ethnological museum of Dak Lak, Trung Nguyen coffee village, coffee restaurant of MeHyCo to try famous coffee of Buon Ma Thuot. Buon Ma Thuot is famous for coffee, especially Weasel coffee - if you're interested in . you can try and see them eating the best ripe coffee berries to make special coffee, called weasel coffee. (coffee season is in november). we will visit weasel coffee, they are eating the best ripe coffee berries (coffee season is in november). We then go to beautiful Lak Lake, on our way we stop some places to see rubber, coffee, plantations, pepper trees, taking some pictures from a beautiful situation overlooking the rice field valley, ..climb a big rock, grannite stone, local people said :‘any person who reaches the top of the rock will be happy and never get old age’ . visit Jun village (the village of M’Nong minority people) share the simple ways of living in many long houses of the village..
row a piragua on Lak Lake to see natural lotus flowers get to M’Lieng village lying along Lak Lake, elephant riding, a great experience. It’s surprising to see how intelligent the elephants are here. They use their trunks to measure the depth of water to make sure the tourists on their backs do not get wet. · At 4 or 5 pm, return to Buon Ma Thuot City.or Buon Ma Thuot airport, depends on your request. 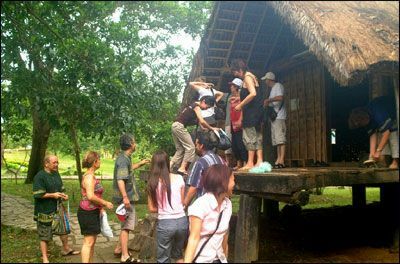 ( If you get to Buon Ma Thuot airport or bus station in early morning and want to stay overnight in Lak resort or in a long house on stilts, in Jun village. We will pick you up to go straight the above metioned itinerary ) After visiting some places... We will get to the Lak lake around 4h or 5 pm, the sunset landscape is so marvellous. This direction of the west is red horizon and on the opposite direction a lot of white clouds surround the mountain tops . ( if it’s not raining) you can take lots of pictures ..
Have dinner with local dishes and spend the delightful night in long house –on- stilts in Jun village near by Lak lake. Staying here, you feel time seems to slow down. tomorrow morning, after breakfast, row a piragua on the lake to see natural lotus flowers, it is very nice, peaceful at the dawn and then have elephant riding, it is interesting, elephants paddle across the lake. Come back to Buon Ma Thuot airport, bus station or leave Lak lake for Da Lat trip, which depends on your request. Lac Lake, located 56 km from Buon Ma Thuot, is in the southern part of the province, close to National Highway 26. The great body of water hemmed between low mountains has been home to many kinds of wading birds for a long time. On the lakeside of Lac Lake is a magnificent palace owned by the last Nguyen King, Bao Dai. Standing on the balcony of the second floor, visitors get a panoramic view of the valley and the lake below. The remains the royal boat which was boarded for short cruises by the owner of the palace, Bao Dai, whenever he stayed in the palace. By the side of LAK LAKE is the sizeable the M'nong Rlam village of Jun with over 30 long houses. Different from the M'nong Gar who live in on-ground houses, the M'nong Rlam live in longhouses which are built on stilts like the Edeh. Their method of building long houses has remained simple and consists mainly of binding bamboo with thatch for the roof and walls, constructing support pillars and framing with wood using tenon-mortise technique. No metal nails are used. The houses are cool and well-ventilated, thanks to the building materials of thatch and bamboo. In the M'nong language, Jun means "jutting out." The village is named Jun because it juts out from green LAK LAKE. Coming to LAK LAKE, you may ride elephants around the village, row dugout canoes on the lake or enjoy the Gong show and drinking jar-wine with the villagers. You are welcome to stay overnight in the traditional longhouses at a budget price, allowing you to experience the local lifestyle of the village. Of course I remember you! And I remember all those nice places we went and the conversations we had. How are you? I am well and writing to you from Sydney, where I am visiting friends for a couple of weeks. It was a pleasure meeting you and I am glad you got to be my guide in the Central Highlands, because you were very professional and always in good humor. I do not know when will I ever come back to the Village of Thuot’s Father, but if I do, I promise to look you up. By the way, if you were to find the house where I lived, maybe I would come back sooner. Stay in contact and I will do the same.